What will top your tree this year? Will you opt for an English traditional fairy, a continental angel, or play safe and affix a star? Nowadays, it seems almost impossible to buy a tree-topper fairy doll – Christmas stores are full of angels. Where have the wand-waving fairies disappeared too? Fifty years ago, it was a different story. Christmas trees, their pine fragrance filling the living rooms, would invariably have a fairy doll sitting proudly on top of the tree. Sometimes, the fairy would be wrapped away on Twelfth Night, to be brought out again for the next Christmas, but often she would be given to a little girl, who would treasure the doll till her wings fell off and her paper skirt crumbled. The majority of fairy dolls were made from hard plastic, dressed simply in white net or crepe paper, with wings made from silver card. Normally the outfits were enhanced with glitter and tinsel, and they carried a star-tipped wand. Stores such as Woolworths would have piles of fairies on the counter; in those days, it was as essential to have a fairy on your tree as it was to make vast quantities of mince-pies. Fairy dolls are fun to collect, and because so many were made it is still possible to hunt out examples in good condition. Manufacturers such as Roddy, Pedigree, Sarold, Rosebud, Palitoy, Airfix and Tudor Rose all produced small fairy dolls, and often they can be found for just a few pounds. Not much to pay for a piece of British tradition! Frequently, small dolls were purchased unclothed, to be dressed at home. In the 1950s, women enjoyed sewing, and it didn`t take long to create a pretty fairy outfit from a few scraps of ribbon, tinsel and lace. No-one knows when fairy dolls first became part of the British tradition – although greenery was used for centuries to decorate houses at Christmas, the continental idea of an indoor tree didn`t take off in Britain till Prince Albert popularised the idea when he married Queen Victoria. Victorians seem to have promoted the idea of Christmas, fuelled by novels such as Charles Dickens` `Pickwick Papers`, which contained festive scenes of merriment, carollers and plum puddings! Sometimes Christmas puddings even contained dolls – not fairies, but tiny little porcelain people moulded all-in-one, less than an inch high. These `pudding dolls` were popular up to the 1920s, and often turn up (if they weren`t swallowed!) in antique shops and collector`s markets. 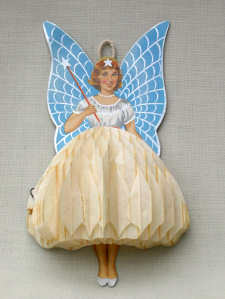 Early fairy dolls were made from paper, wax, composition, papier-mâché, porcelain or celluloid. Celluloid dolls must have been hazardous, especially when topping a 1920`s tree lit with candles, while the paper variety were probably not much better. No doubt many families played safe by dressing a small composition doll, or perhaps one of the little Japanese coarse-bisque dolls, as fairies – but parents everywhere must have breathed a sigh of relief when electric `fairy lights` became the norm for Christmas tree decorations. In 1957, the Colgate-Palmolive company issued a promotional fairy doll, which was sent in return for soap wrappers and a small sum of money. The doll was hard plastic, and made by Roddy. She wore a white satin dress edged with silver braid, and carried a sparkly wand. Sometimes these dolls turn up, still with the original letter, which reads, `I am sorry that I have been compelled to send you a circular letter, but so great has been the demand for our little Palmolive Fairy Doll that it has been impossible to write to everyone individually.` Imagine getting a polite letter like that from a send-away promotion today! You normally don`t even receive a compliments slip. A doll like this, still mint and with the original letter and box, would probably cost in the region of £30. Some of the prettiest fairies were made by Rosebud. The `Miss Rosebud` dressed jointed dolls are quite expensive to buy today – you would be lucky to find one wearing her original outfit for under £50 – but the straight-legged type of Rosebuds are cheaper, and just as cute. Look out for Rosebud`s cheery pixies, too – nice, colourful dolls to add to a Christmas collection. Airfix, the makers of plastic kits, also made small dolls. Often found are tiny, four-inch high types dressed as fairies in crepe paper skirts. Usually, of course, the skirts are torn and split, so if you can find one in perfect condition, it`s a bonus, and sometimes the paper skirts are topped with net or gauze. The fairies carry wands topped with a glitter-sprinkled cardboard star – later models have plastic stars – and they wear tinsel crowns on top of their moulded hair. These dolls were sold very cheaply in stores such as Woolworths during the 1950s, and one in reasonable condition can be found today for around £10, though a perfect specimen will be more. 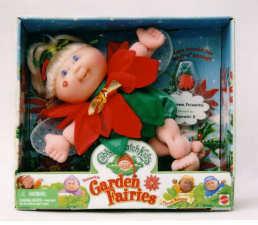 Mattel brought out a range of Cabbage Patch fairies a few years ago. Too big to go on the tree, they still made a fun collectable, and amongst them were several Christmas specials, including Poinsetta, Holly Berry, Christmas Wish and Snow Magic. In America, a Wal-Mart 2000 exclusive was `Holiday Scented`, wearing an iridescent white dress trimmed with holly leaves and white fur. Her box bore a rhyme, `Holidays come once a year – here`s a friend that`s sweet and dear.` Expect to pay £20 plus for the Christmas special Cabbage Patch fairies. A famous British illustrator of fairies was Cecily Mary Barker, who wrote a series of books in the 1920s. Sixty years later, Hornby toys produced a range of little dolls based on the paintings, and, of course, amongst them was a Christmas Tree Fairy. Prettily dressed in finely-pleated white nylon with a green cross-over ribbon decorating the bodice, this doll can also occasionally be found in a variation of the outfit, made from white lace. Hornby also produced a Holly Pixie. One of the most beautiful present-day fairy dolls is, unfortunately, rather too large and heavy for the Christmas tree, though she would make a stunning table centre. Standing fourteen inches high, the Alberon Christmas Tree fairy is also based on Cecily Mary Barker`s Flower Fairy books. Made from porcelain, this stunning doll wears an iridescent full-skirted dress with matching wings. The dress is trimmed with green gauzy ribbon and she carries a gold wand. As the light catches the dress, it gleams pink and green, resembling mother-of-pearl. These dolls retail for around £40. One company which does still produce a traditional fairy doll, just eight inches high, is Amanda-Jane. Amanda-Jane dolls have been made since the early 1960s by a company based in Wales. Their adorable pink-skirted little girl dolls, with diaphanous wings and fairy wands, are available by mail-order from the address shown below. Furthermore, they are safe for children. Most of the angels sold today as tree-toppers are made from porcelain and wire, which could be dangerous if they broke in a child`s hands. 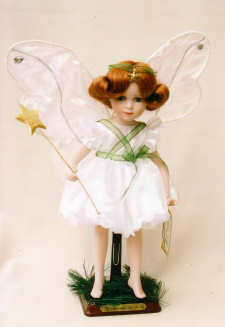 Why not be traditional this year, and seek out a fairy doll to make your Christmas magical.